Book Description: Western Connecticut consists of a rich mixture of culture, history, sport, ingenuity and agriculture—and the Danbury Fair drank deeply from its roots. While it started as a place for farmers and horsemen to share their respective arts, it grew to become so much more. Leahy’s veneration for P.T. Barnum and his desire to keep up with the changing times led him to enthusiastically try new things, some successfully and others not quite so. 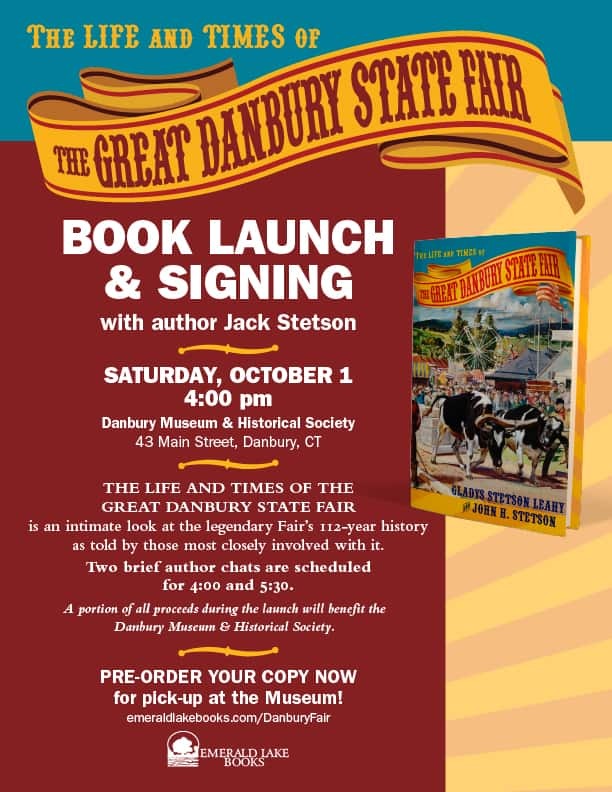 Project Info: The Life and Times of the Great Danbury State Fair was a story begun by Gladys Stetson Leahy at the behest of her husband, John W. Leahy. When she had completed it in 1956, the manuscript was set aside when it was decided that publishing it would be too expensive. Fast forward 25 years to when Gladys’ grandson, John H. Stetson (aka “Jack”), discovered the manuscript in the attic of her home following her death in 1981, shortly after the last Fair was held. While it took some time to accomplish, Jack took on the responsibility of completing the work his grandmother had begun in honor of the Fair they both loved, as well as the man who influenced it most, John Leahy. Having learned about Emerald Lake Books from an article in a local newspaper, Jack reached out to us to take all of the content and photographs he’d pulled together over the years and create something worthy of the Fair. What a pleasure this project has been for us! Mark Gerber, our art director, is a transplant to this area. He arrived just a couple of years after the Fair ended. After all of the time spent on this project, he’s been known to lament, “I miss it,” and he was never there. We hope that we have done justice to the labor of love that Gladys and Jack began, and to all those who miss the Fair still. A charming chronicle of an annual fair in Danbury, Connecticut, begun by the late Gladys Stetson Leahy and recently finished by her grandson. In 1956, John Leahy, the owner and general manager of the Great Danbury State Fair, convinced his wife to write its history. The first few chapters of the result are more about the Leahys’ domestic life than the fair itself, but the author’s gift for amusing anecdotes and telling details makes it eminently readable. Readers will be won over by the second page when she recounts her reaction to her husband’s sudden insistence that she write the book: “This wasn’t so bad. What if he had decided I ought to learn to play the clavichord? I have a friend whose husband, all unsolicited, brought home an Irish harp for her birthday.” She begins with the history of agricultural fairs in general before settling into the origin of Danbury’s in the late 19th century, and then she jumps to World War II, when wartime shortages forced its temporary closing. Her husband became the fair’s majority stockholder and general manager during that hiatus and oversaw its resumption in 1946. Despite fires, racing accidents, and bad weather, the fair thrived throughout the period covered by the author, who ends her section in 1956, encouraging readers to attend the fair themselves. After she found that it was too expensive to have the book published, she put the manuscript away in her attic, where her grandson found it after her death. Stetson later added a section covering the years from 1956 to 1981, including the fair’s demise, despite attempts by locals to save it. He’s a less-engaging writer than his grandmother, but he still moves the history along briskly, providing a different point of view on John Leahy and on the fair—that of a child who grew up amid its pageantry. He recounts travels with his step-grandfather to other fairs and conventions as far away as Calgary, Alberta, and his increasing involvement in running the fair as he grew. His grief at the sale of the fairgrounds to a company that later built a shopping mall will sadden readers as well. 312 pages with 177 photographs. After you click the Buy Now button, look for the Shopping Cart that will appear in the bottom right-hand corner of this page. You’ll have to click that to complete your purchase.